With the regular rounds of memes and articles that get around harping on about ‘kids these days’ and how they lack discipline and are basically entitled, disrespectful little blighters, really come as no surprise whatsoever. Throughout time, older generations have bemoaned ‘kids these days’ and waxed lyrical about ‘back in my day…’. It’s nothing new. What is interesting today, is that with social media sending these things viral, it isn’t just the older generation having a dig. Nope, now everyone, sometimes even those who would still be categorised as a ’kid’ these days, or even those currently raising the kids of today are buying in and jumping in on the bandwagon of blame. Nearly every single one of these posts will recommend a stronger, more authoritarian approach to child rearing. From Cry It Out for babies, to smacking toddlers and children, to shaming and humiliating children and teens, all for their own good. So they know their place. As they apparently did, ‘back in my day’. All of the problems we face as a society with the youth of the day stems from parents being too soft, too easily pushed over, lack of boundaries and lack of physical punishment for consequences. I am a parent of young children and also a primary school teacher so I have a pretty good exposure to mainstream, commonplace, socially accepted parenting practices that are happening right now and I have to say I am deeply confused. Mainstream parenting is mainstream because it practiced by the MAJORITY of parents in society, right? Well mainstream parenting IS pretty much all of these authoritarian components! I know, because I choose to parent differently and I am completely at odds with the vast majority of parents around me. I honestly cannot see very much room for many families to take a ‘tougher’ approach than they already take without it becoming downright cruel. But this brings us to the main point- if most people are already parenting in this harsh authoritarian way that people so wholeheartedly believe will raise the children we want and need for the society of the future then WHY is this current generation still bemoaning ‘kids these days’? If after all is said and done, the majority of children are still not growing to be the adults we wish to see in this society, then maybe the way the majority of people raise their children may not indeed be the best way to achieve the goal. Very few families raise their children using gentle, peaceful or attachment parenting principles. Very few people are indeed ‘soft’ with their children. But as someone who is living and breathing a gentler style of parenting, I do not fear that my own children will grow to be simply ‘the kids these days’. I do not fear it because I do not rely on my children needing me or their dad to put the fear of god into them to make good, fair, respectful choices. I do not fear it because my children will be raised as fully connected, fully understood, fully appreciated people in their own right who are comfortable in their own skin so they feel comfortable with those around them. I do not fear it because they are being raised as empathetic, thinking, feeling humans. I do not fear it because they have had boundaries set and held with compassion as their age and needs have dictated. You cannot blame the woes of society and youth on practices that are rarely employed and rarely the issue. Permissive parenting is an issue but I have very occasionally seen parents of the gentler ilk who genuinely struggled to guide their child and establish the boundaries that were needed but more often the permissive parents I’ve come across have been mainstream but more ambivalent to their children in general. I can vividly recall many occasions of parents yelling, threatening and telling their child, ‘no’ before giving in as though they’d been defeated. This isn’t them being in any way aligned with a gentle approach. Their decision to change their mind does not mask their very mainstream approach to behaviour and it does not mask how it fails frequently when it comes down to power plays and power struggles. Mainstream society- it’s time to take responsibility. It’s time to reflect on what is really going on. It’s time to see that maybe ‘tough love’ isn’t the way we are going to see any real change in society that is already a harsh enough place as it is. If you want more responsible, empathetic, independent thinking people, let’s start treating our children with respect from their very first days so that they know that they belong, that they matter, that those around them matter. Let’s stop teaching them to only do things because there is a reward or punishment attached. Let’s stop expecting them to blindly obey us and then wonder why they are so easily lead as teens. When you are at your lowest and most challenging, you always learn more from those who bother to listen, connect and support you. Our children are no different. The time for change is now. If you have recently clicked ‘like’ on any of these ‘kids these days’ posts, it’s time to do a solid review of what is really at the heart of the issue. 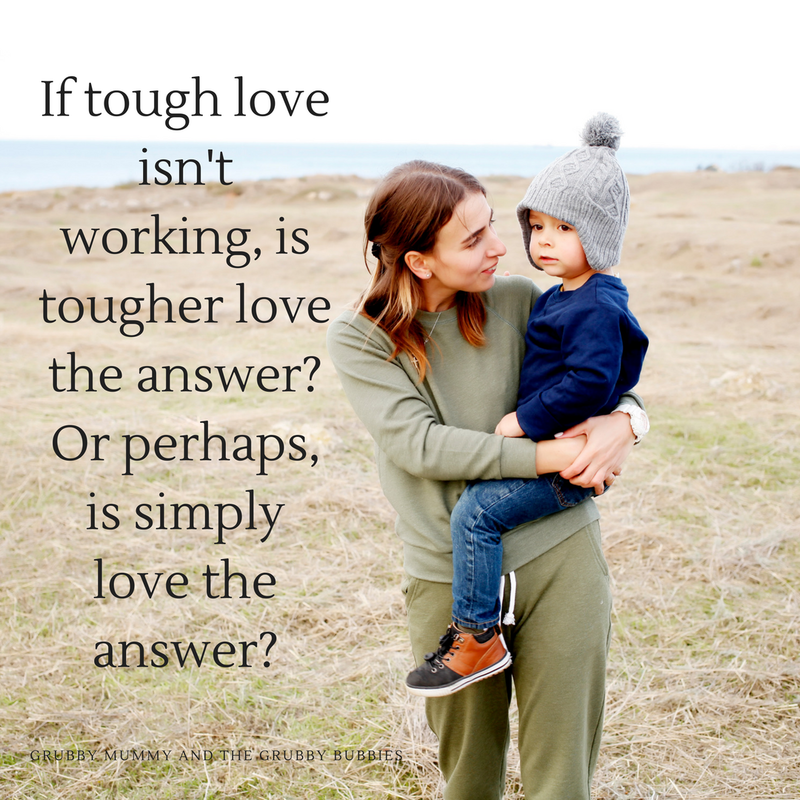 If tough love isn’t working, is tougher love the answer? Or perhaps, is simply love the answer? It’s worth contemplating and discussing further. .
Our kids these days are worth it!